Once again the Faith Mennonite Church community and the Seward Neighborhood Group, and the SNG Environment Committee will be co-sponsoring the Neighborhood Sustainability Fair, where you and your friends and family can bring small electronics to recycle—including old cell phones, defunct electric toothbrushes, old laptops, or digital thermometers. You can also bring your bike for a tune-up, your gently used clothing for the clothing swap, and garden seeds for the seed exchange. Find out how to start a worm box, meet the worms up personal, and maybe get a worm to feed our visiting chickens. Or come to the SNG Environment Committee table to find out whether we owe you $150.00. In case all this whets your appetite, Sisters Camelot will be serving free food from their famous bus. This is an opportunity to meet your neighbors, who are contributing to a more sustainable neighborhood, and to share your ideas with them. Try to bike or walk, as parking will be at a premium and traffic will be problematic, due to two fairs on the same day. We welcome volunteers to help with set-up, take-down, and tabling. If you have a sustainable living skill you can share or an organization you’d like to represent, we invite you to contact us. E-mail Phil Stoltzfus, at minstaff@faithmennonite.org. This entry was posted in Uncategorized and tagged Environment, events on March 28, 2013 by Peter Fleck. Neighborhood Sustainability Fair! Please Join Us! Please join us at the Seward Neighborhood Sustainability Fair, Saturday, March 17, 2012, from 1:00-5:00 pm. 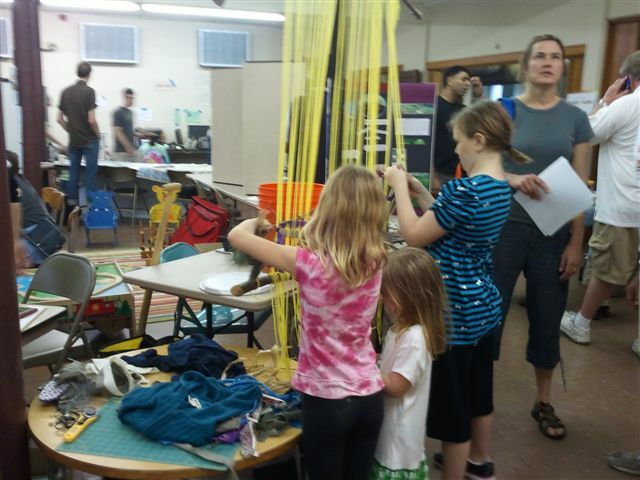 The fair will be held at Faith Mennonite Church, 2720 East 22nd St., Minneapolis, in the Seward neighborhood. Your neighbors and local groups that work towards sustainability would like to share their ideas with you–and have you join them in such activities as a Clothing X-Change (bring clothes to swap), small Electronics Recycling (bring those old cell phones, P4 computer processors, harddrive and DVD drives, etc., but no CRT’s, please), garden seeds to swap, and your bike that needs tuning or repairing. Meet your local urban farmer and find out what Seward Coop is up to. Find out what tips your neighbors have about ways they work towards using less of the Earth’s resources and becoming more self reliant. We are all part of an interdependent web of plants, animals, air, sun, water, and other people. Bring materials that are part of your life or that connect you to this great living tapestry–to weave together with your neighbors. You can bring a strip from favorite clothing or ribbons that hold pictures showing loved ones or places you love, or vines and stems or even plastic strips–anything you can think of. We want to create an event which is fun and hopeful, while providing opportunities for learning, networking, and increasing the sustainability of our daily lives. Please join us! This entry was posted in Uncategorized and tagged Environment, events, neighborhood churches on March 3, 2012 by Peter Fleck. Hello Seward Neighbors and lovers of May Day! I know many of you have been very active in May Day, including all of your artists, and those that have been real Food Justice and Compost Advocates, so I wanted to share this with you too! I wanted to let you know that I rescheduled the May Day 2012 Food Justice and Compost Brainstorm for Friday, March 2nd from 12-12. At this brainstorm, we will be coming up with ideas together on how to make ideas around food justice and compost interactive, and how to capture the energy of the day into something that encourages attendees to get more involved. At May Day this year, there will be an Off the Grid section (where the soccer/baseball fields are). In this section, we hope to create a mini “Transition Town” with a town square and all. We will be hopefully offering skill sharing opportunities, riding weird bikes, and doing other fun things. We could build mosaics and other types of things that we could keep in our neighborhoods. There are lots of ideas that each of you hold in your heads that just explode when you get other folks in the room jabbering about how awesome this/ that might be. We hope to sit in a room with you, and let these happen, and then try to see whats feasible. This year these are happening around three main focus areas: Transportation, Energy, and Food. Folks are brainstorming about each of these topics separately, and at some point soon (mid March) we will bring all of these ideas together to see what’s feasible). In April we will have some build dates, to build puppets and other things that we can use to make our “Transition Town”. These dates will be set shortly, and I will let you know all about them. *The Living Green Expo happens this same weekend. They’ve got their style down pat, and there’s no need to mimic that! We want these ideas to be birthed out of the creativity, traditions, and style of what May Day is to each of us. That means lets leave the info tables in info alley, and find creative ways to share info with folks. Let’s think outside of the box on how to engage our neighbors and neighborhoods. What can we really do to inspire ourselves and others to live in harmony with the world. *How can we honor everyone who is doing this already! Many cultures, including those that live right here in community, do many activities that are already more sustainable than the American way of life. How can we honor those? *Commons. Please feel free to share this email with friends, we want to be able to share ideas and thoughts widely. *In the Heart of the Beast, has a GREEN TEAM, working on energy, food, and waste for the festival itself. We need many volunteers for each of these ventures. Spread this widely. I hope you are as excited about this as I am, and I hope you are able to come. Please email me back with an RSVP (corrine.bruning at gmail.com), or let me know if you are unable to meet during the day time. Also, please feel free to email/ call with questions (612) 229-4471. The location more than likely will be In the Heart of the Beast Puppet and Mask Theater, I will update this post when it has been confirmed! This entry was posted in Uncategorized and tagged Environment, events, Gardens on February 20, 2012 by Peter Fleck. Last year, Common Ground Meditation Center (2700 East 26th Street and site of the old Diner Restaurant) was granted funding from the Mississippi Watershed Management Organization (MWMO) to help in making site improvements that would increase green space at the site and also benefit the Mississippi River by decreasing impervious surfaces, reducing runoff and pollutant generation; and increasing infiltration. The plan also provided for diverse planting with an emphasis on native plants. The document below describes the project in more detail. Drop by and check out the gardens! To read more about Common Ground, here’s a Bridge article from 2009. This entry was posted in Uncategorized and tagged Environment, neighborhood organizations on October 7, 2011 by Peter Fleck. Have Your Ice Dams from Last Winter Melted Yet? Community Energy Services has the resources and rebates to melt away your ice dam problems. Ice dams can ruin a perfectly good Minnesota winter. Eliminate the problem before it reappears this season. We'll provide you with the resources on certified contractors, insulation rebates, and more. Attending a FREE presentation qualifies your for a home visit by a team of our energy experts. The home assessment is only $30 and we'll supply $400 in services and materials. 98% of homeowners who attend our workshop follow up with a home visit – because it's a remarkable services and value. The next presentation is Tuesday, October 4th, at 6:30 PM at Matthews Park Recreation Center (2318 29th Ave S). Call (612) 219-7334 or go to www.mnces.orgfor more details and to reserve your workshop spot. Additional workshop dates available online. This entry was posted in Uncategorized and tagged Environment, events, homeowners on September 29, 2011 by Peter Fleck. all containers (metal cans, plastic bottles and glass containers and jars). Residents in the pilot area also are eligible to receive NEW recycling containers to aid with the two-sort system. The Minneapolis Sanitation & Recycling Office will provide two or more recycling receptacles at no cost to residents. There are several choices but the Seward Neighborhood Group encourages residents to request the wheeled, 22 gallon recycling carts with lids as their preferred receptacle. Residents who want the new containers should complete and return the selection card that the City mailed to residents the week of March 22, 2011. 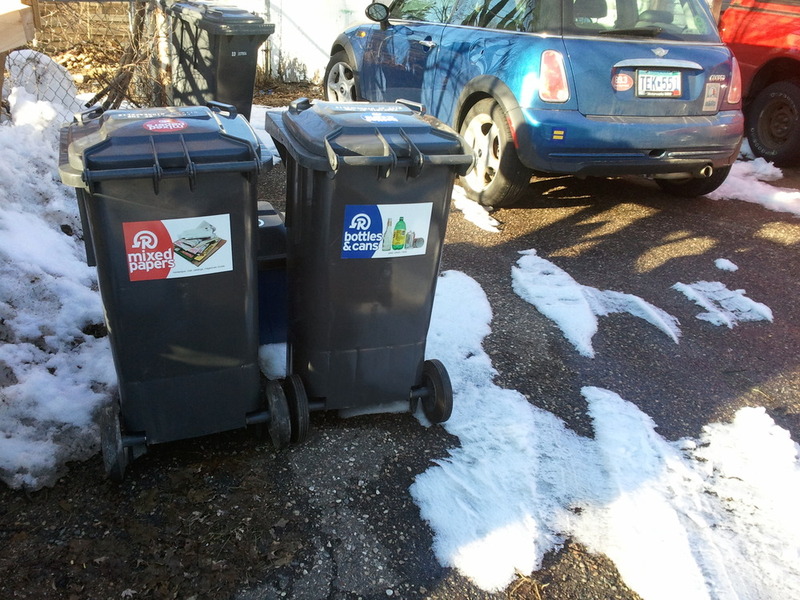 Pilot area residents who did not receive the card (or might have misplaced it) can obtain another by calling the office of Minneapolis Solid Waste & Recycling Services at 612-673-2917 or by contacting SNG co-president, Mike Trdan, at mnmichaelrecycle@gmail.com. At present the City has no additional publicity planned for this project. For the Enhanced Recycling Pilot Project to succeed, the neighborhood’s help and involvement is needed. The Seward Neighborhood Group is attempting to establish a network of “Recycling Block Coordinators” to inform and educate neighbors about the project. Volunteer Block Coordinators would be asked for about 1/2 to 1 hour of time per month to promote recycling. Residents interested in helping as Block Coordinators should email Mike Trdan, at mnmichaelrecycle@gmail.com. This entry was posted in Uncategorized and tagged Environment, recycling, SNG on April 9, 2011 by Peter Fleck.